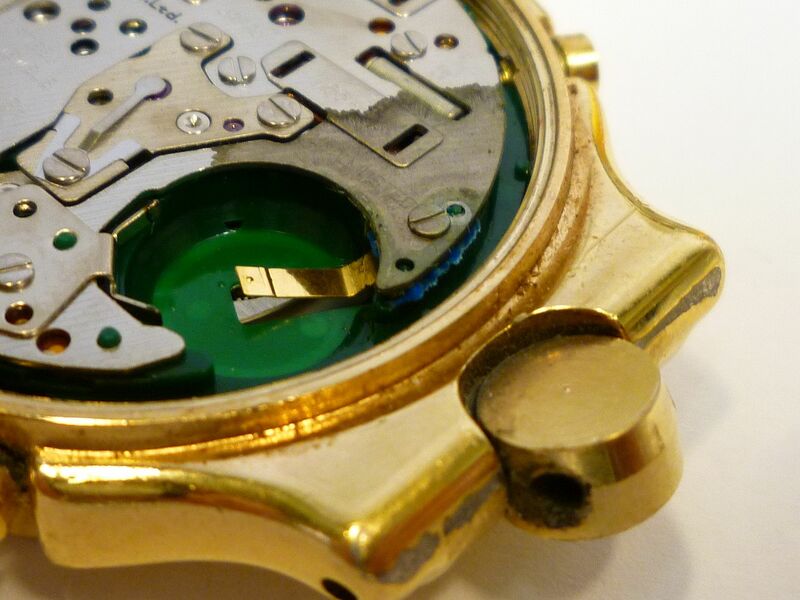 Forum Home > Parts Info, Tech Tips and Tinkering > Sticky: A salutory warning about checking (which) watch batteries you're using ! As you may have already read, last week, I bought another stainless 7A38-7190 SAA053J, that was advertised as 'NOS and unworn'. 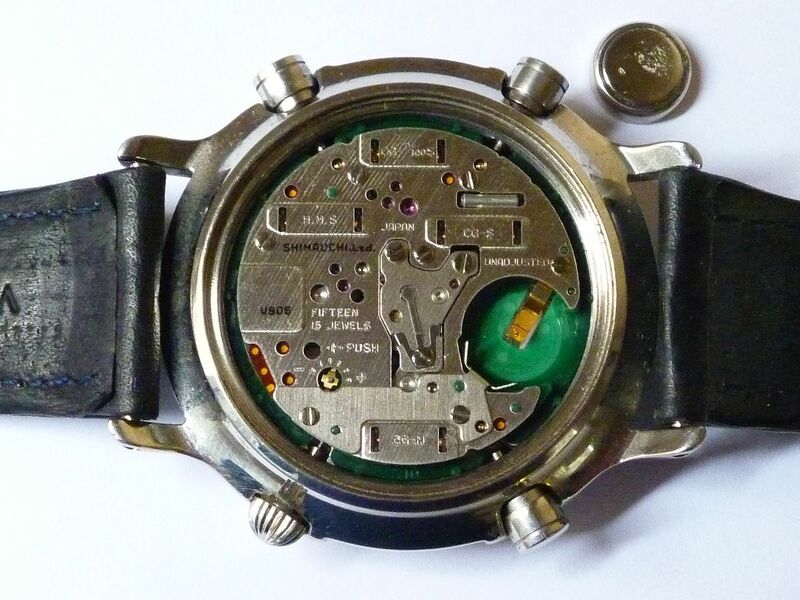 It clearly wasn't; one of the issues being a couple of unidentified marks (one of which looks like a 'zit') on the 9 o'clock subdial. I'd already decided to swap the dial / movement over from my previous one, in an effort to make the best example from the two. .... and I noticed the other stainless 7A38-7190 was showing a low battery indicator, with the second hand clicking every two seconds. Great timing, or so I thought. I had a couple of plays with the chrono' buttons, and sure enough, the alternate revolutions of the 1/10s sub-dial confirmed just that. This morning, the battery appeared to have gained a new lease of life, overnight - and everything appeared to be working normally. Regardless, I was going to fit a new battery as I swapped the movements over - as I already knew it was on the way out. Now, with hindsight, it seems I may have been a bit remiss in checking over my previously acquired stainless 7A38-7190. My Excel spreadsheet which includes the date I purchased a watch, and date of last battery change read: August 2010 / Then new. It seems I hadn't undone the case-back since then to check what battery had actually been fitted by the previous owner. But up until this week, it had been fine anyway. Right ? When I undid the case-back I found an undersized # 399 had been fitted, but worse still that the positive battery plate was corroded. 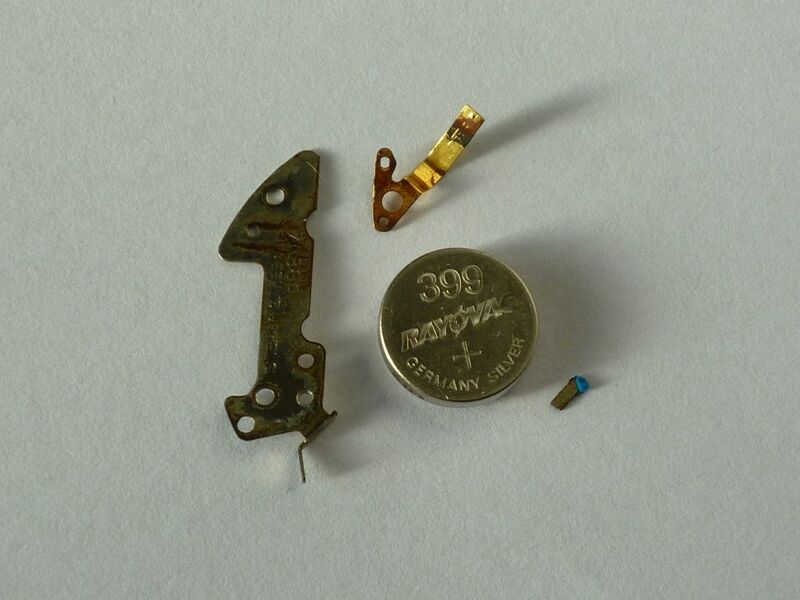 I gingerly pried the old battery out, and one of the positive battery plate 'fingers' literally fell off. It had been eaten right through. Inside the battery well was a pool of liquid, and the gold-plated negative battery terminal had been badly tarnished. I didn't bother to take any photos at this point - my first priority was getting this mess cleaned up quicky. and of course to enable me to replace the badly tarnished negative terminal, which at this stage looks distinctly beyond cleaning up ! Now, up until fairly recently I'd always been an advocate for using Maxell SR936SW (# 394) Silver Oxide batteries, and nothing else. which just happen to be double the price ! So I've switched to using Renata #394 Silver Oxide (@ the same price Maxell used to be). I have also previously warned against using cheaper alkaline batteries and particularly chinese-made brands like Camelion. But other 'reputable' companies' Silver Oxide batteries should be OK, as well - shouldn't they ? I give you the working RAYOVAC (made in Germany) battery which came so close to destroying the insides of one of my 7A38's. I have never bought Rayovac, if a battery has leaked in a watch i have bought....it is usually a Rayovac! I used to buy Maxell, but now I use Renata and very good they are too. I have always considered Rayovac batteries to be cheap, as many "£4 battery change" corner shop jack-of-all-trades seem to use them. 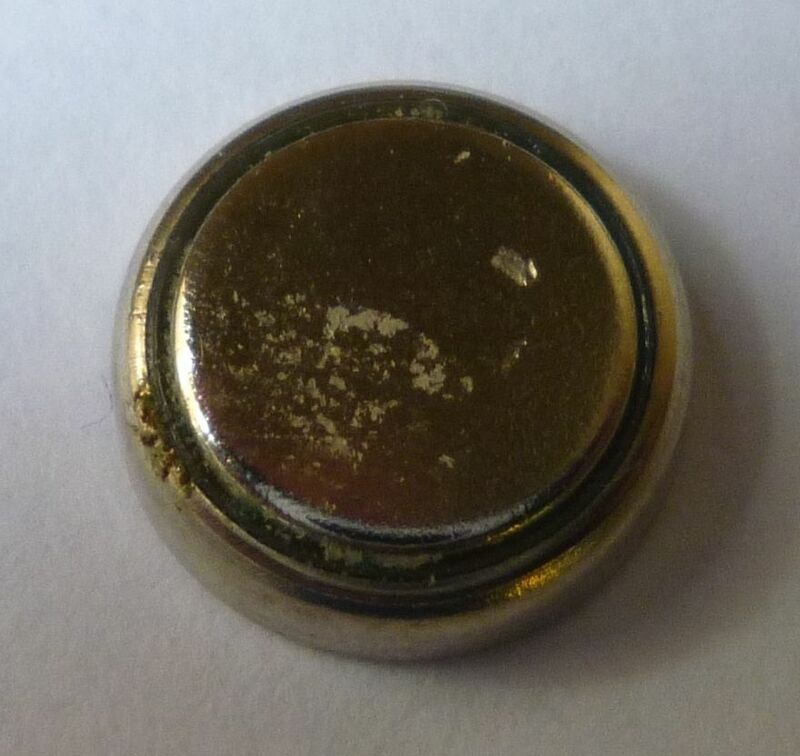 I find Duracell batterys seem to be fairly cheap on ebay, considering the horrendous damage that cheap&nasty batterys can do. Some very informative new posts on 7A28/38 care and maintenance Paul, much appreciated by us newbies! Since when have you been a 'newbie', Chris ? I myself consider a year into messing about with watches to be but the tip-of-the-iceberg. Paul, You tend to forget that you are an Enigma in the watch world, I was reading your intellectual/Informed comments on forums years before getting involved in collecting, simply by doing vague searches on google. 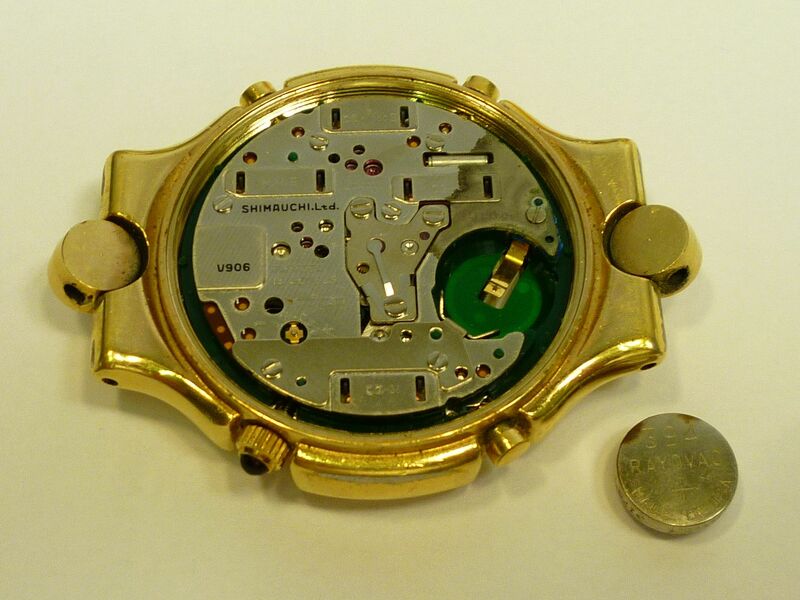 I am not beating your drum, but believe you have a fantastically complex but eager mind and have ended up building a great site down to your own perseverance, due to you wishing to restore a vintage Seiko 7A38 that Seiko were not willing/able to work with. This action must surely be applauded,and I have learnt much in this last year,even if things get muddled due to our eBay paths crossing. Thanks for the compliments, Chris. I think. Though I've never been called an Enigma before. Lots of other things though. 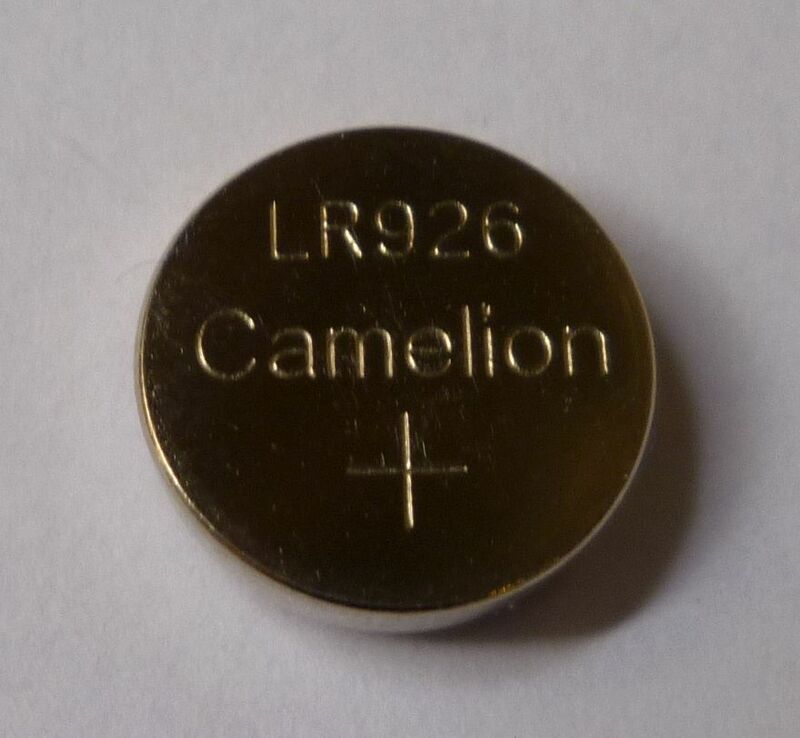 I came across another leaking Rayovac battery this morning and I'm rapidly coming to the conclusion these are far worse than any of the cheap Chinese made brands I've encountered, like Camelion or Tianqiu, to name but two. This time it was a correct size # 394, made in USA, as opposed to a # 399 made in Germany. 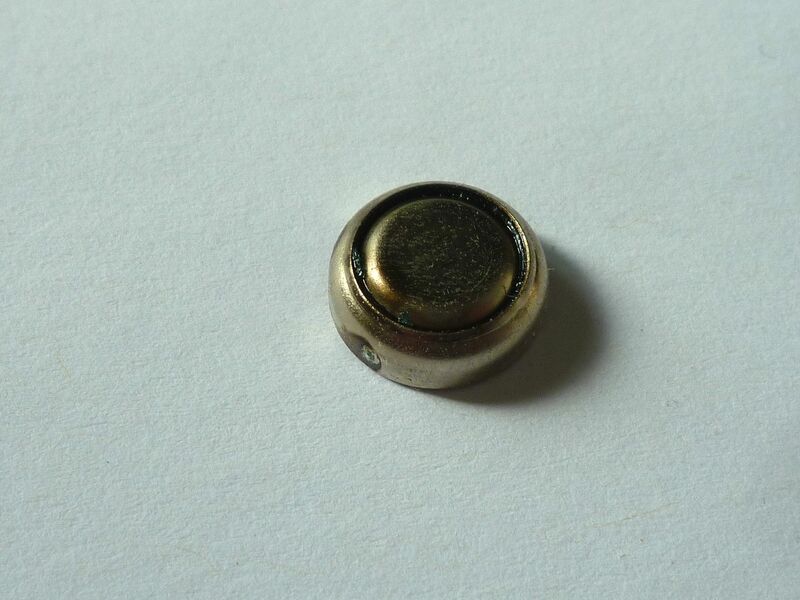 It was completely dead - in the dressy Yema N8YM53 I'd bought on eBay France last week. Please excuse the less than stellar photos. My priority was to get the mess cleaned up, before it spread any further. When I popped the old battery out, my first action, before grabbing my camera, was to mop out the pool of clear liquid that I found in the battery well. It was all over the gold plated negative terminal too. Note once again the bright blue suphate deposits (as in the previous 7A38-7190). Have You managed to rescue the Yema ? if so, was just cleaning the parts enough or was it necessary to swap some parts ? All sorted, a long time ago. It needed a good clean up, but although the PCB looked O.K., I ended up having to replace it. 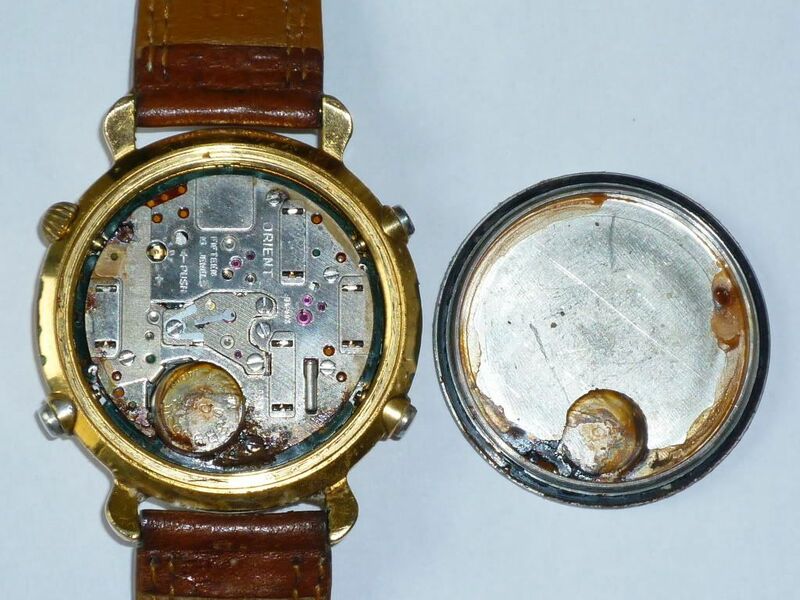 Somewhere in another thread (I can't remember which one now) a forum member (again my memory fails me) stated that whenever he bought a quartz watch he opened the case-back and checked the battery - regardless of whether the watch was running or not. In the past I'll admit that I haven't always been quite so diligent - witness the tale of the stainless 7A38-7190 which started off this thread. I thought I ought to have a quick look-see. The antimagnetic back-plate was nice and shiny; both the positive terminal plate and the battery fitted looked spotless from above, but I have an instant dislike for the brand, so I popped it out. .... far worse than any of the cheap Chinese made brands I've encountered, like Camelion or Tianqiu, to name but two. Name and shame that is. Another very good reason to avoid using these cheap and nasty batteries at any cost (saving). 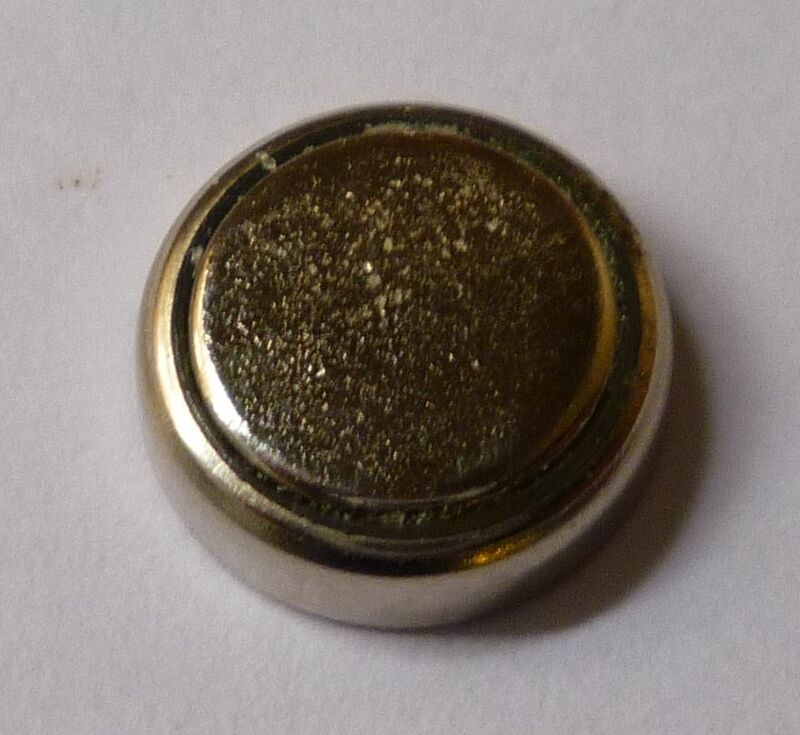 Another warning - about FAKE batteries ! Needless to say I normally keep a good supply of Renata # 394 batteries in stock. I buy them in packs of 10's from Cousins UK. I also keep a 10 pack of # 399's to cover the odd 7T32, etc. and also of 371's and 377's for my little collection of intel watches. Last week a friend at work asked me to change the battery in his Rado. Got home, popped the back off and it needed a # 315. I wasn't about to order a 10 pack from Cousins, just for a one-off. So I went looking on eBay. It arrived yesterday. It was posted second class in just a normal manila envelope, so the 'bubble' part of the battery packaging was all crumpled up. But through it I could see that there was a strange 'blister-like' flaw on the top polished surface of the cell. The printing on the top of the package looks very sub-standard, as if it has been rubber-stamped. 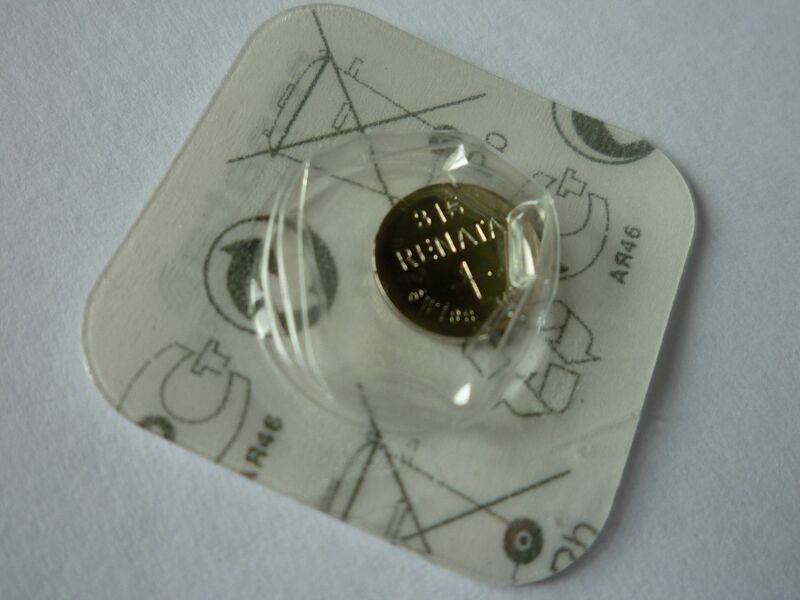 I think I've just been sold a FAKE Renata battery. Case opened in eBay's resolution center, awaiting seller's response. If I get time, I'll post some photos later. Caveat Emptor !! I can't cut open the packet to get a clear shot of the battery itself, because the seller has now requested I return it for a full refund. 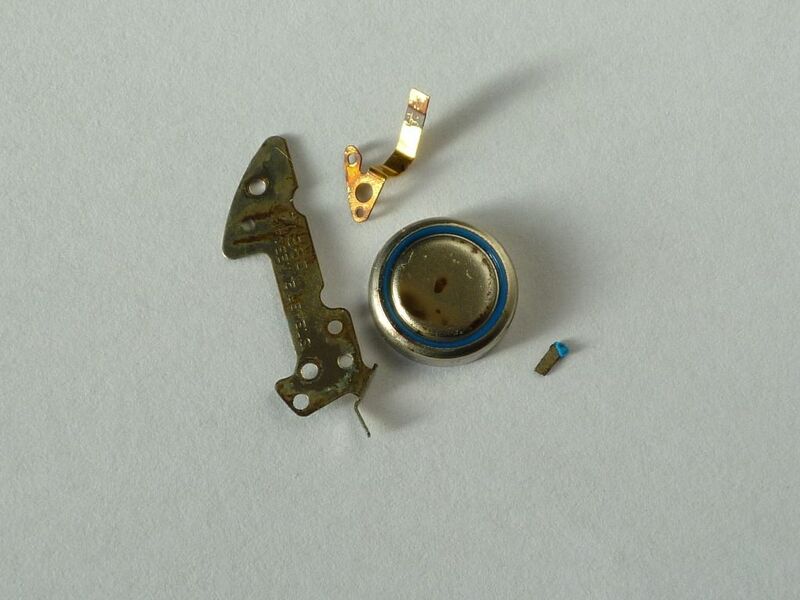 Not wishing to give Sony undeserved bad press, but the worst example of damage to a movement by an old run-down leaking battery, that I've ever personally encountered - in an Orient J39908-70 '7A38', was caused by a Sony battery. Perhaps that one was a fake. Now, up until fairly recently I'd always been an advocate for using Maxell SR936SW (# 394) Silver Oxide batteries, and nothing else. But earlier this year, they appear to have stopped producing them (as such), and now offer a 'Mercury-Free' equivalent (same p/n) - which just happen to be double the price ! So I've switched to using Renata #394 Silver Oxide (@ the same price Maxell used to be). Happy 5th Anniversary – Seiko 7A38 And Maxell #394 ! Checking my Cousins invoice folder, at that time, in late 2010, a 10-pack of (pre-M/F) Maxell #394 batteries cost £4.80 + VAT. When Maxell introduced their 'Mercury Free' versions the price doubled to a Tenner ! .... Hence why I switched to Renata. More data here: http://www.sii.co.jp/en/me/datasheets/silver-oxide/seizaiken/ .... Guess what I'll be ordering next time ? I read that post on the SWCF. Most interesting. 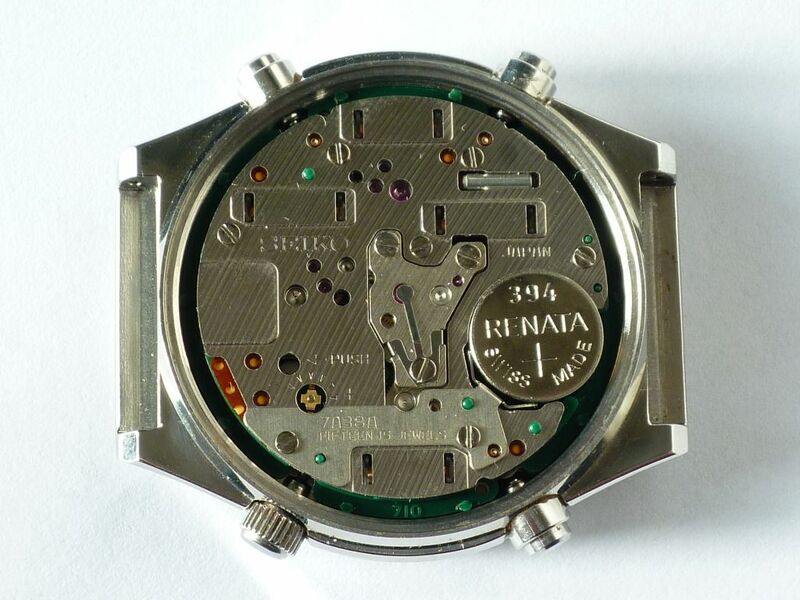 I have always used Renata and never had a problem, but then I do keep a close eye on my watches. I'm now trying Energiser for no scientific reason! 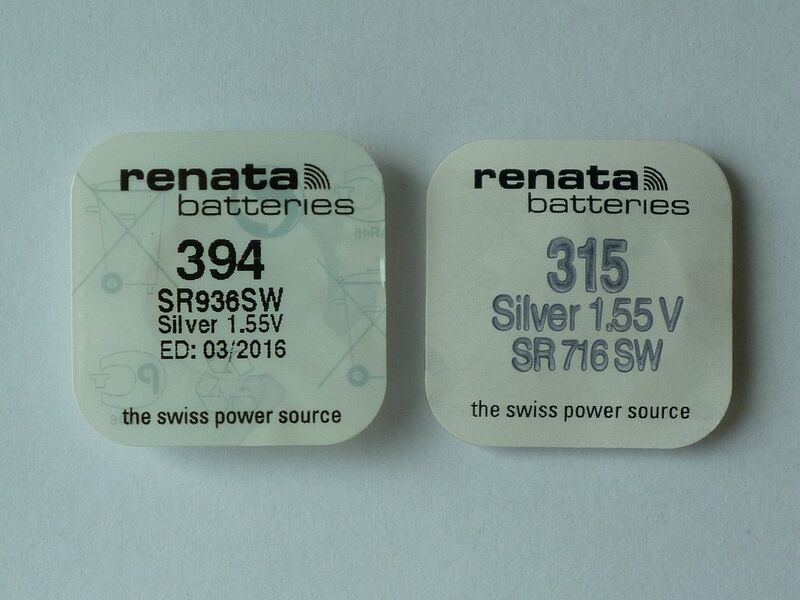 It may be that the OP on SCWF had picked a batch of fake Renata batteries. There's a lot of them about apparently. So it not only pays to buy a good brand, but to get them from a reputable source (i.e not eBay or Amazon).